Sport utility vehicles (SUVs) have become the rage in the auto industry and on the roadways in recent years because of their versatility. You can haul lumber from Home Depot in the morning and drive in style to the opera in the evening. There's no need to have both a sedan and a pickup truck to transport your diverse lifestyles. That same multi-purpose concept has found its way into the golf bag business. X-Sports, based in Santa Ana, Calif., introduced its Sport Utility Golf bag (SUG) this fall. It is a hybrid stand bag and cart bag for those who alternate between walking the course and riding in a cart - or at least want the option to choose between a pedestrian and motorized round. "We have not only created a brand new bag with the SUG, but a brand new (utility) category that's been missing in the business," said Xavier Anguiano, X-Sport's owner and president, and an industry veteran. 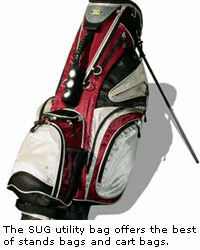 "A lot of players own two bags, one to carry and take to the range, and another to use when riding in a cart. 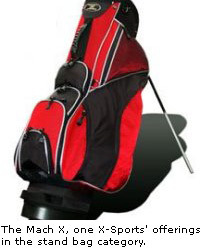 The Sport Utility Golf bag is the first golf bag that's designed to be used both ways." The SUG weighs in at just under a very lightweight five pounds, making it ideal for hoofing it with your clubs on your shoulders for 7,000-plus yards. But it also offers the same functionality of most larger and heavier cart bags, including enough storage pockets that you can bring along every golf accessory you own (and a picnic lunch if you're so inclined). The SUG bag is made of reverse square-stitched 1200 Denier Nylon. What that means to non textile engineers is that the golf bag is made of a high quality, high weave fabric that is going to resist moisture, resist fading and is easy to clean if it gets soiled. "Reverse stitch is what makes the bag so light," said Anguiano. "It makes the tensile strength 10 times higher than normal nylon but usually about 35 percent lighter weight than any other nylon or polyester material." The bag features a seven-way top, a putter well, full-length dividers, 13 pockets including a microfiber-lined valuables pocket, full-length clothing pockets and a beverage holder. A rubberized "Gripper" bottom features a quick-release stand to keep the bag stable at any angle. X-Sports is far from a newcomer to the golf bag business. The six-year-old company annually manufactures and delivers approximately 165,000 bags into North American golf markets - numbers that push its golf bag production above the one million mark. For most of the company's existence, it worked behind the scenes as a bag supplier to the industry under other brand names. Anguiano saw too many manufacturers looking at golf bags not as performance items, but as "billboards to put their names on." That spurred him to emphasize developing performance bags under the X-Sports name because of the "void" of high quality golf bags in the marketplace. "A golf bag is an integral part of your equipment," said Anguiano. "If it carries easy, if it is functional, your mind is going to be where it needs to be - on your game. That's what X-Sports bags are designed to do." The SUG was developed with the feedback of several Canadian Tour players. Elisabeth Esterl, who kept her mind on her game and off her bag well enough to finish second on the Ladies European Tour money list in 2003, is a representative for X-Sports' bags. For those who can't decide between a stand bag and a cart bag, X-Sports offers golfers the best of both worlds with its new SUG utility concept. Unlike the SUV, four-wheel drive is not an option. The SUG comes in four color themes: black/champagne/burgundy, black/burgundy/silver, black/burnt orange/silver, and black/sonic blue/ silver. The suggested retail price of the SUG is $169.95. The bag was pre-released in the fourth quarter of 2003. 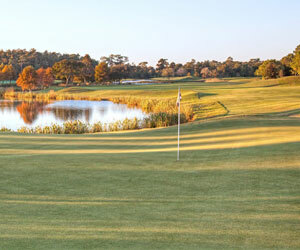 Its official debut will come at the PGA Merchandise Show in Orlando in February 2004. Bags can be purchased on the X-Sports Web site, at local country club pro shops, and at golf specialty shops, including Edwin Watts, Golf Galaxy and Roger Dunn's. 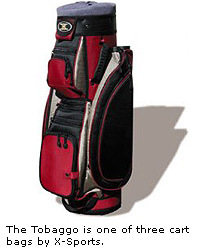 X-Sports also carries a full line of stand bags, carry bags, cart bags, junior bags and travel covers.